Argentina may be topping the group, but, are they in top form.While Messi's side had already qualified for the last 16, even a win would not have been enough for Jamaica. 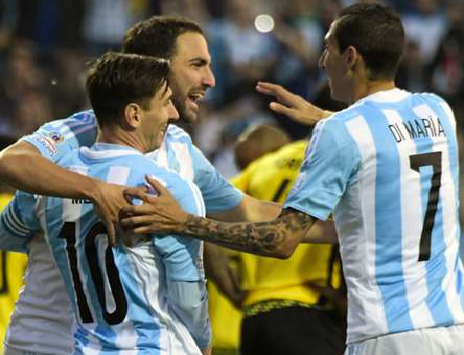 Argentina 1-0 Jamaica: Higuain's 11th-minute strike proves decisive and it sends Argentina into the quarter-finals as Group B winners. The Reggae Boyz are eliminated, but they've got the Gold Cup to look forward to.Winning his 100th cap, Messi, 27, was kept at bay but Napoli striker Higuain fired home from inside the box. A glorified practice match,the only things that betrayed it were that it was so low-scoring, that Argentina only won 1-0, and that Pablo Zabaleta incurred a booking that will keep him out of the quarterfinal through suspension.Lionel Messi claims Uruguay's approach was simply to try to prevent Argentina from playing in their Copa America group clash, but insists his team is on track after their 1-0 win.Argentina boss Gerardo Martino - watching from the stands after receiving a one-match ban for stepping on the field against Uruguay - rested Sergio Aguero and Nicolas Otamendi and drafted in Higuain and Martin Demichelis. Jamaica forward took a selfie with Lionel Messi. "Messi is the best in the world, a star, and that's a photo I'll have as a souvenir all my life," said Brown.